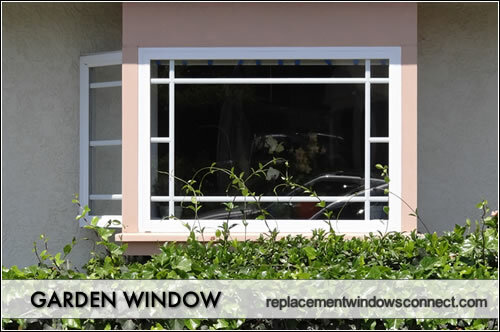 Garden window prices encompass a huge range, anywhere from $650 to $4500 installed. Whether you spend at the low end or the high end of this will depend on the frame material and glass package, the size of the garden windows, options and hardware selected and the cost of the installation. Entry level garden windows wil typically be a vinyl frame and may not have many options or colors to choose from. It will usually be smaller in size, say around 36″W x 48″H. At this price range, it will probably use fixed frames, meaning you cannot open the windows for ventilation etc. The glass will be a simple low-e double pane. Standard set ups may use a high end vinyl, a composite or a fiberglass frame. These set ups might include an awning or a casement window that opens to allow the outside breezes to enter. The glass will be a mid grade low-e with either argon or krypton fills. High end garden windows will usually be fiberglass or wood clad frames. Expensive setups are usually larger, often a custom ordered window that is made to spec. They may come in a wide selection of tints and color options. The glass package will be double or triple paned, use a high end low-e glass. Many companies have names for their high end class glass packages so check with the manufacturer. Expect a range of $150 to $2000 for garden window installation cost. The lower end is for replacements that can be simply swapped into an existing “hole” and do not involve additional labor. If a larger frame is being used, the contractor may have to reinforce the area, widen the opening and then install the window. The Milgard Montecito is a good option in this range. Okna makes a very nice garden window that will fall in this price point. Loewen or Andersen 400 Woodwright Series are possibilities at this high end. Included installation and minor framing prep work. Price is for product only, not install pricing. Pricing is for windows only. Add $1,000 for metal roofing on the windows (copper is most popular). Add 20% to the cost for tempered window glass. Add 10% to the cost for low-e glass options. Add $50 per window for grids or grilles. Add $25 per window for insect screens.